Organize the garage with this 5-Piece hook Assortment. Constructed from heavy duty iron with non-slip coated finish, these hooks are easy to install for wall storage of tools, Garden hoses, lawn furniture, etc. 3 most used size hooks included. DESIGN FOR HEAVY OBJECTS -Heavy duty storage hooks in 3 most used size. 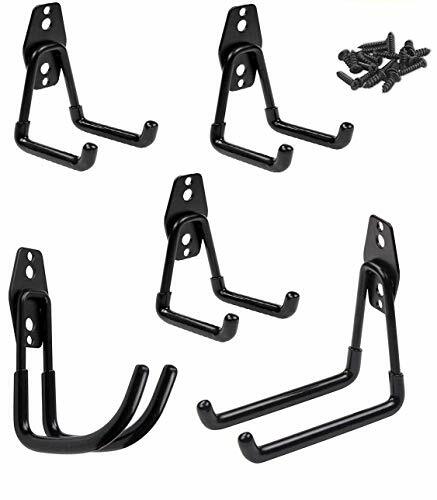 Set of 5 wall mounted u-hooks with anti-slip coating safely hold 30 pounds or more when properly installed. SPACE SAVER -Mount simply on hardwood, studded walls, block or brick with screws and wall plugs (included). It creates an efficient storage space for your folded chairs, ladders, bicycles, tools, and other bulky items. EASY INSTALLATION - The notches and spike at the back of the plate allow you to fasten or adjust the hook plates easier. Endless options for efficient storage in the garage, shop, basement, or shed. PREMIUM MATERIAL - The hooks are made of heavy duty iron and rubber coated hook provides added visibility, safety and grip. They're durable to endure heavy weights and prevent slips for years! WARRANTY AND 100% MONEY BACK GUARANTEE - We stand by the quality of our products. We offer a 180-Day Money Back Guarantee and a 2 Year Manufacturer's Warranty. If you have any questions about this product by KESO HOME, contact us by completing and submitting the form below. If you are looking for a specif part number, please include it with your message.